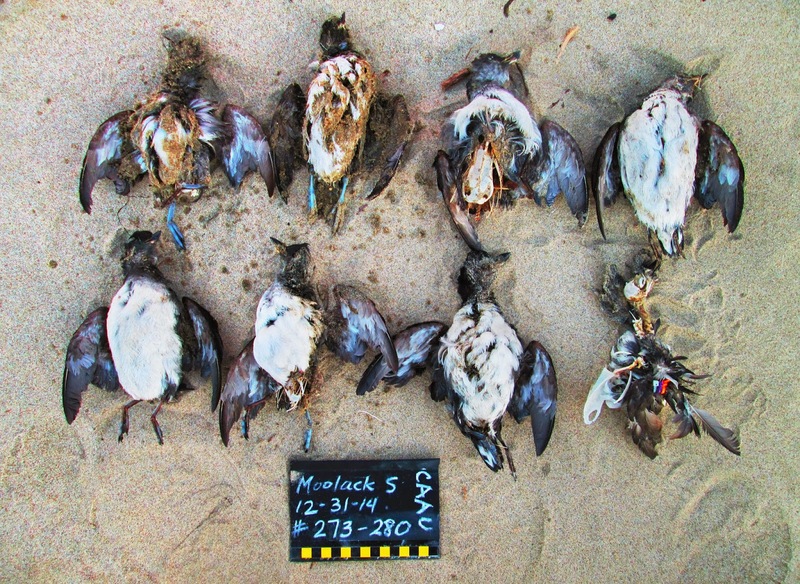 ﻿﻿﻿﻿﻿﻿﻿﻿﻿This winter tens of thousands of dead Cassin's Auklets have appeared on beaches all along the Pacific Coast, 10 to 100 times normal rates, according to the University of Washington report "Cassin's Auklet North Pacific Winter Wreck 2014-2015". Volunteers with COASST and CoastWatch have been collecting and counting specimens, many of which were autopsied to determine cause of death. 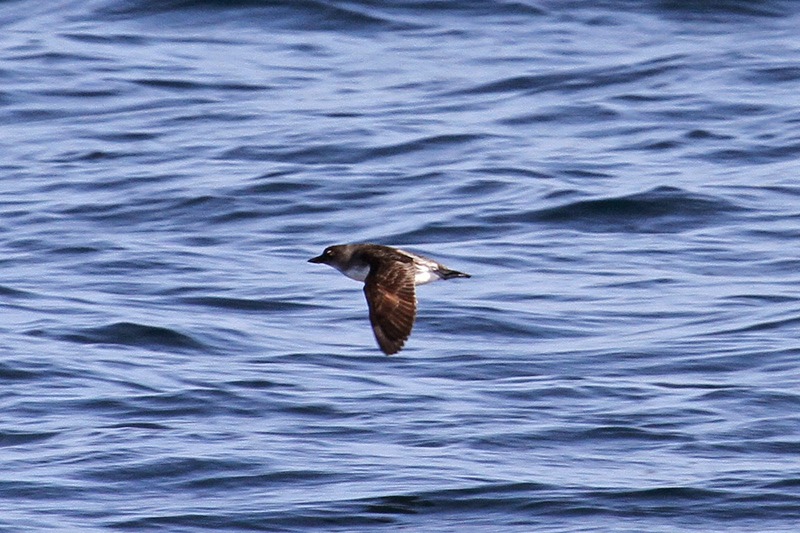 Audubon Magazine's "Lost at Sea: Starving Birds in a Warming World" agrees with UW and others that the dead birds are juveniles who starved for reasons associated with global warming. Unfortunately, Bayocean participated in this "wreck". 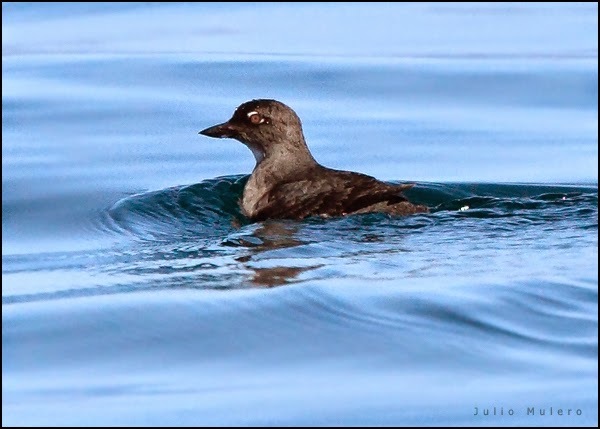 In a CoastWatch report on December 26, 2014, Cape Meares resident Olli Olikainen counted 126 dead auklets along Mile 289, which is at the northern end of the ocean side of the spit, and 121 dead auklets along Mile 286. The Cape Meares Community Association web site lists others who helped out: Keith and Anita Johanson, BJ Byron, Kevin and Kathy Burke, Carolyn Olikainen, Wendy Kunkel, Dave Audet, John Harland, Ciel Downing, Rod Pelson, and Pete Steen. Thanks to all of you for doing this unpleasant but important work. ﻿﻿The good new is that Olli saw no dead birds on March 30, 2015 , just a few remaining bones and feathers. Hopefully all seen on Bayocean in the future will be flying by like little tennis balls against the backdrop of a coastal sunset. 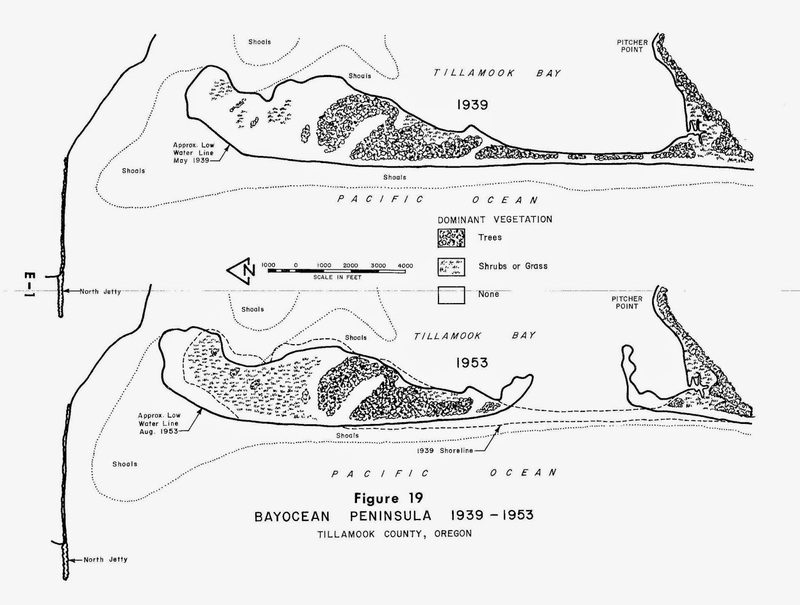 In Oregon Coastal Atlas I mentioned a web viewer set up by Tanya Haddad to view changes in Bayocean's shorelines from 1939 to 1964, using aerial photographs from the Army Corps of Engineers. The four diagrams below show the changes in a different way. 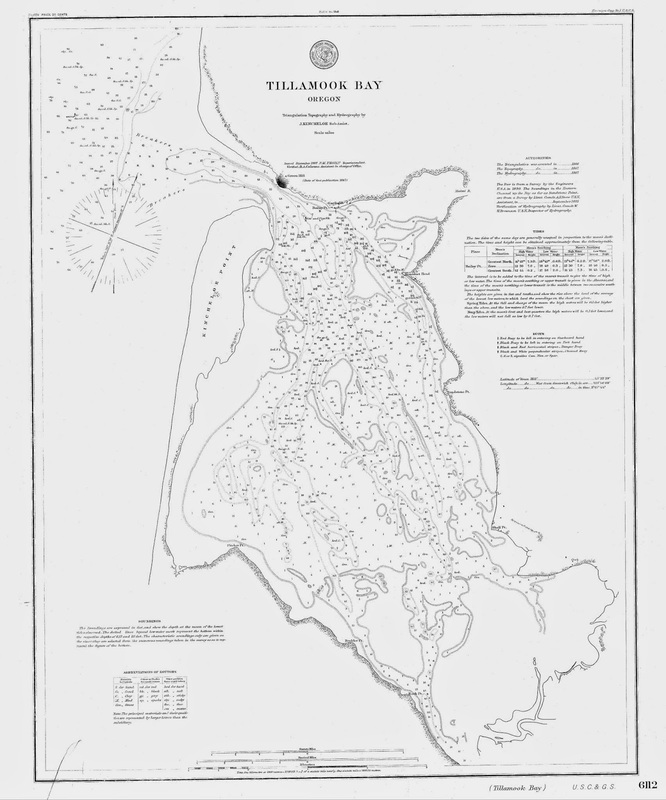 Figures 19 and 20 are the last two pages of the Final Impact Statement for the Extension of Tillamook South Jetty, again provided by the Corps. If you've hiked the signed trails on Bayocean you'll have noticed that the ones on the bay side are just off Dike Road, while the ones on the ocean side are not visible from the beach. Rather, they are posted where trees begin. I wondered if that was because they were installed before the south jetty was built and thus could be used to see how much sand accretion could be attributed to them. Since the Tillamook County Parks Department is in charge of trail maintenance, I called Director Del Schleichert to find out. Del informed me that the signs were placed there in the early 2000s, just before he was hired. He said they were made of a weather-resistant, composite material by workers employed at a state correctional institution, with the date stamped on the back. I confirmed this during a hike April 8, 2015. They were all stamped either June 2002 or November 2001. Signs are not placed on the fore dunes because the sand is constantly shifting. 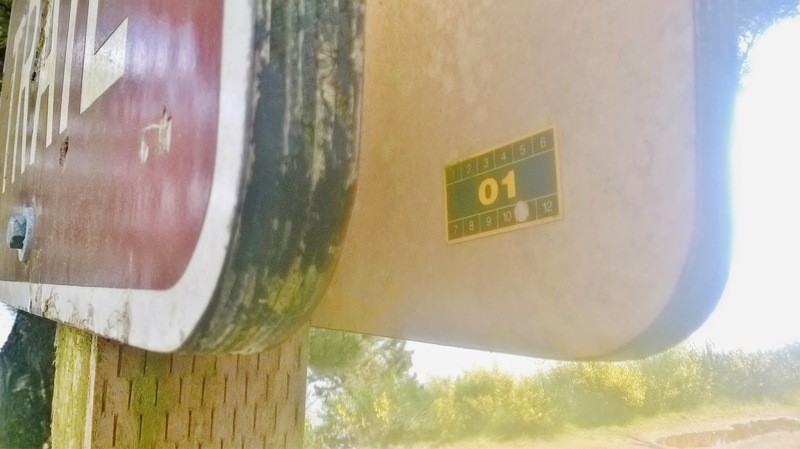 Thus, any signs installed, or trails built, would require constant maintenance. Tillamook County just doesn't have the budget for that. Bayocean hiking enthusiasts have resolved the problem on their own by placing and maintaining tripods and posts with colored strings to let folks know where they need to leave the beach. Once up on the fore dune you can see the trails sign or footprints leading to them. On behalf of those of us who benefit from those tripods I'd like to thank those who set them up. 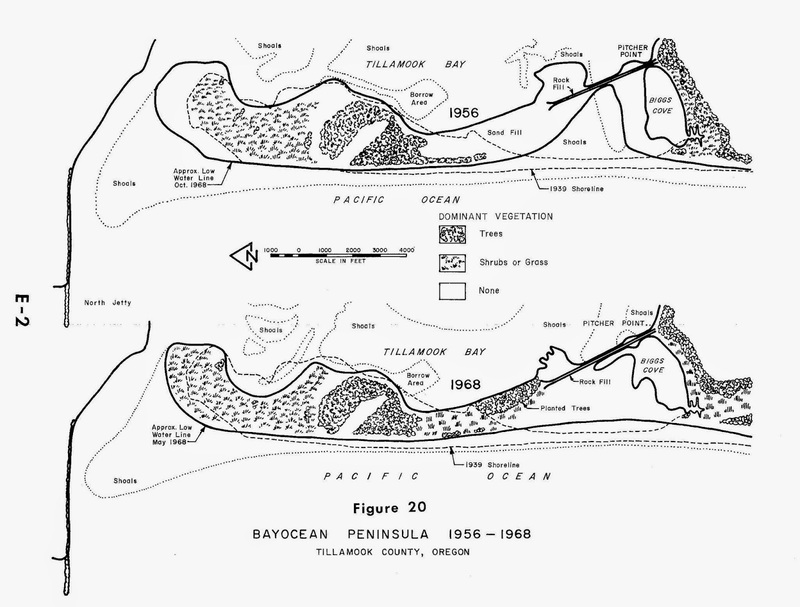 As to accretion of sand attributable to the south jetty, that can be seen in aerial photographs and sketches drawn by the US Corps of Engineers. Time lapse photo overlays at Google Earth show very little change since 1994. 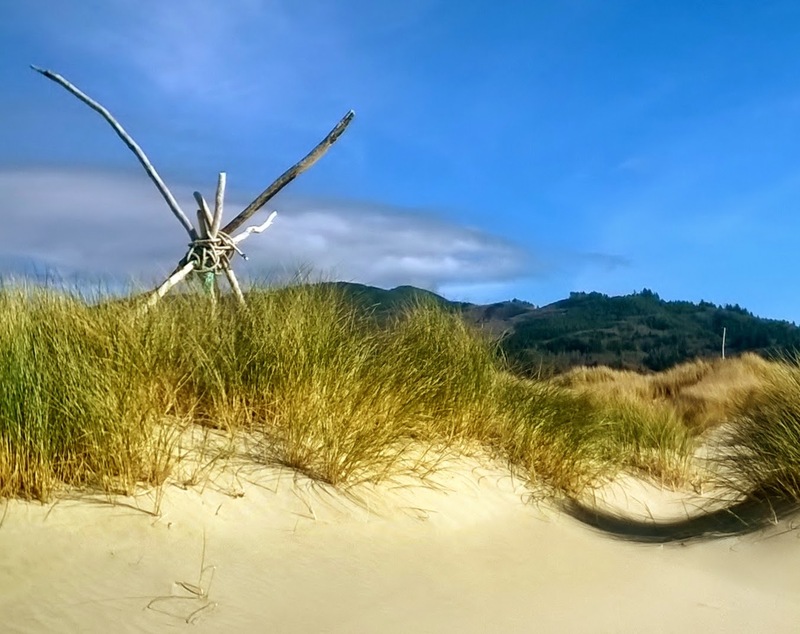 On April 9, the Tillamook County Board of Commissioners voted unanimously to direct the Tillamook County Planning Department to initiate steps to change the zoning of Bayocean Spit from Recreation Management (RM) to Recreation Normal (RN). 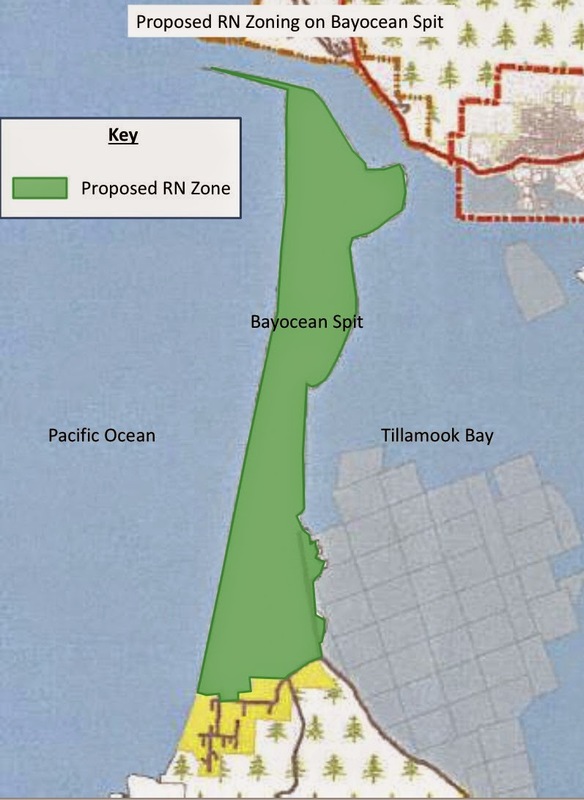 If finalized, this change, which was requested by the Cape Meares Community Association (CMCA), would preclude commercial development like the recent Bay Ocean LLC proposal to build an eco-park, which was rejected by Tillamook County Planning Commission. John Harland was the primary spokesperson for the CMCA. He argued that any commercial development on Bayocean would be inappropriate for reasons detailed at the CMCA web site . Vic Affolter, Deborah Neal, Chris Spence, and Charles J. Ansorge also spoke in favor of the zone change. 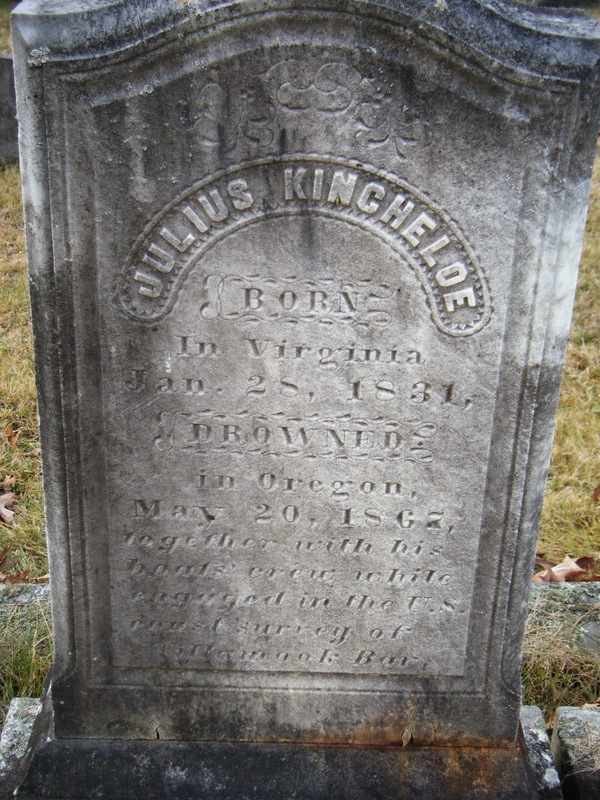 See the notes taken by Ansorge, CMCA President. 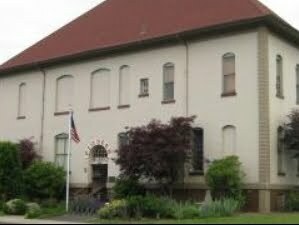 According to multiple sources, including a story in the Tillamook County Pioneer, approximately 50 people attended the special workshop, with most of them in favor of the change. 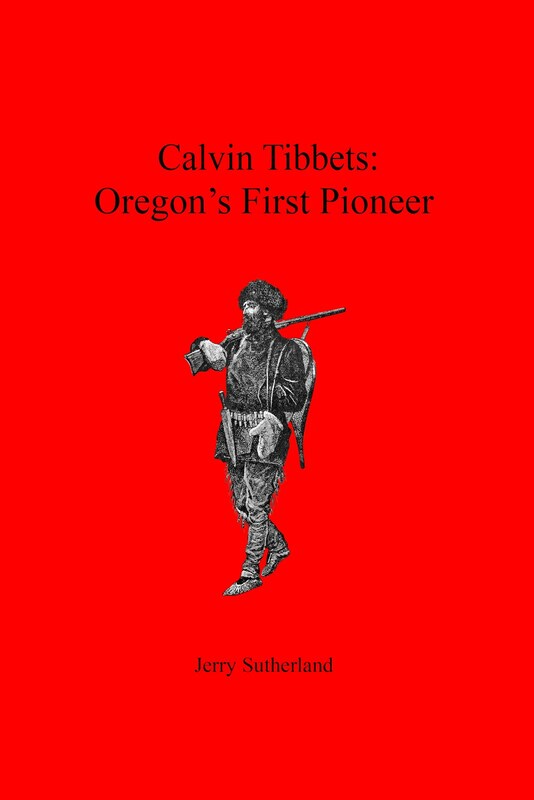 An article in the Tillamook Headlight Herald covered the one exception at great length. Chris Stellflug said that his family's desire to build a cabin on the shoreline of Cape Meares Lake had been stymied by zone changes since buying the property in the 1960s. They also may want to build a commercial fish farm in Cape Meares Lake, most of which covers land owned by them. As long as the proposed zone change has no effect on them, Stellflug said they would not object to it. Commissioners Tim Josi and Mark Labart both made statements supporting that outcome. This decision to proceed by the Board of County Commissioners is just the first step. After thePlanning Department drafts a proposal, their Planning Commission will hold public hearings and make a recommendation to the Board of County Commissioners. Josi expected that process to take about four months.